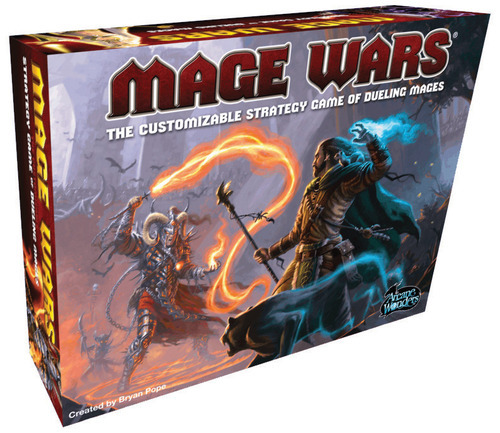 Mage Wars was designed by Brian and Benjamin Pope, and is being released by Arcane Wonders. It is a 2 player game that can be played with more, and takes around 90 minutes. Age range is listed as 8+. The theme is fairly standard for a fantasy card game – two Mages are casting spells and trying to destroy each other. 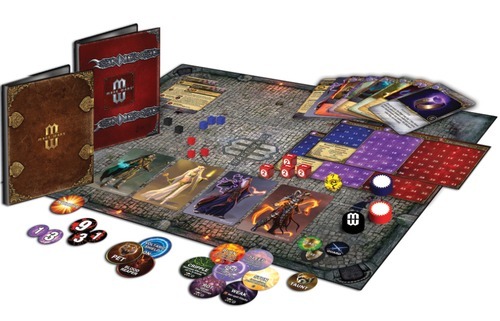 However, there are some unique mechanisms in Mage Wars that set it apart. In the box, you get an Arena Gameboard, 2 Spellbooks, 322 Spell Cards, 4 Mage Cards, 4 Mage Ability Cards, 2 Mage Status Boards, 8 Status Cubes, 20 Action Markers, 2 Quickcast Markers, 9 Attack Dice, 1 Effect Die (d12), 24 Damage Counters, 8 Mana Counters, 7 Guard Markers, 6 Ready Markers, 20 Condition Markers, 3 Ability Markers, and an Initiative Marker. At the start of the game, each player will choose a Mage to play – you can choose Beastmaster (who can use animals to his advantage), Priestess (who can call on the power of the gods), Warlock (who can call on the forces of darkness), and Wizard (who can summon the elements). Players will put their mage cards in their respective corners of the board (marked by doors), as well as their action and quickcast markers. On your status board, you’ll mark your starting channeling, life value, and mana supply. Mages all start with 10 mana, but other totals vary from character to character. Before your game, you’ll have to build your spell book. Games like Magic: The Gathering have people build a deck of cards, but in Mage Wars, you’re building a book. This means that all cards you have will be available for you throughout the game. No shuffling, no hoping for the right card to come out at the exact right time. The book has sleeve pages, and you can organize them however you want. You have a certain number of spell points to use, and some spells will cost more than others based on the school of magic and your specialties. You can’t include more than six copies of any one spell. There are some suggestions for your first book. Once the spell books are set, the game proceeds in rounds. Each round is divided into two stages: the ready stage and the action stage. The ready stage (bookkeeping) has six components: initiative, reset, channel, upkeep, planning, and deployment. INITIATIVE: In the first round, players roll to see who has initiative. In subsequent rounds, the player with the initiative marker passes it to the other player. RESET: All action, quickcast, and ready markers are flipped to their active side. CHANNEL: Each mage adds mana equal to their channeling level to their supply. UPKEEP: Pay mana to upkeep any spells that need it. PLANNING: Choose up to two spells from your spellbook to play. You don’t actually have to cast them, but these are all you can use in the round. You can also prepare one spell for familiars and objects (like Spawnpoints). DEPLOYMENT: You pay mana to cast the spells you chose to your Spawnpoints. The action stage has three steps: the first quickcast phase, the creature action phases, and the final quickcast phase. FIRST QUICKCAST: You can cast a quick spell that has a quickspell icon. This is done in initiative order. If you do, you flip your quickcast marker. CREATURE ACTION: Players take turns activate and using one creature that they control. You can choose to pass if you have fewer active creatures than your opponent, but as soon as you’re even, you have to start activating. Creatures first move and take a quick action (attack, cast a spell, guard, take another move, take a special action, or do nothing), or they can stay put and take a full action (attack, cast a spell, take a special action). When the creature is activated, you flip it over to its inactive side. You can also choose to do a quick spell before or after a creature’s action phase, flipping your quickcast marker (you can only do this if you didn’t do a first quickcast). FINAL QUICKCAST: After all creatures have activated, you can do a final quickcast as long as your quickcast marker hasn’t been flipped. The game goes until one mage is destroyed. The other mage wins. I think the biggest innovation of a game like this is the use of the spellbook. At the GenCon demo, the guy made a point to say that there were no rares, no cards to collect. The CCG is going the way of the dodo because most people these days just want to have the full game in the box and not have to take out a third mortgage to feed their habit. Not that the Magic community isn’t still alive and kicking – but I digress. Having a spellbook rather than a deck of cards means that you can build the spells you want and have complete access to them throughout the game. You don’t have that one card that would devastate your opponent unless it gets stuck at the bottom of your deck. You are in control, and I think that’s a novel way to approach it. It’s been interesting to follow the development of this game. They demoed it last year at Origins and GenCon, but are just now releasing it. Kind of an unusual marketing strategy, but it seems to be working for them. People are very excited about it. Mage Wars has been compared favorably to games like Magic: The Gathering and Summoner Wars, and that’s a good thing. The art and components I got to see in my brief five-minute visit to the Arcane Wonders booth looked great, and this is a game I’d really like to explore sometime. It might have been fun to do a full demo because I think this is a game I’d really need to try before I buy. I’m sure most of the game’s more unique qualities will come out in game play. Thanks for reading!